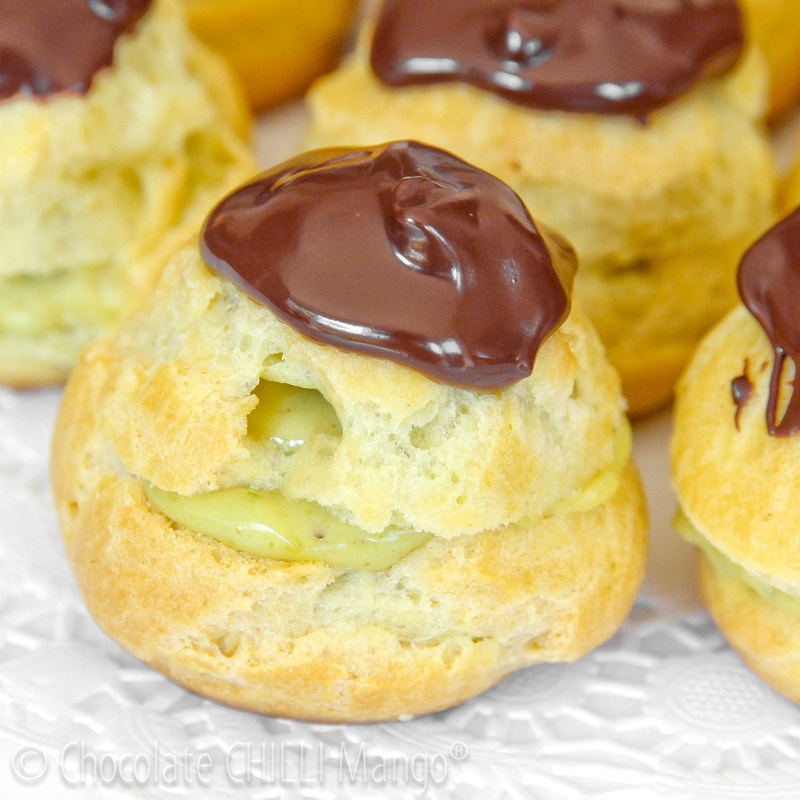 If the choux fits … go ahead, eat it and enjoy the experience! 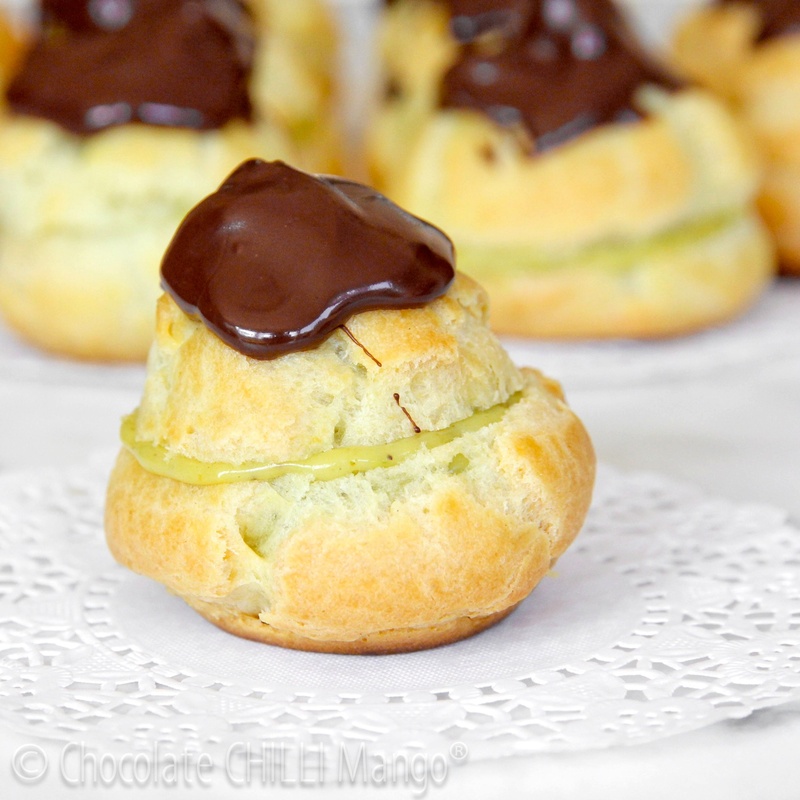 Which begs the question of why it has taken so long for me to post a recipe here featuring choux. It’s not as though I haven’t made any over the past year. I have. Lots of times. Really … you can see some quick shots I got of a few here. A while ago, I was lucky to have the gorgeous Gourmantine ask me to do a guest post on her wonderful recipe blog and I posted a recipe for Bigne allo Zabaione. I mean, who doesn’t go ga-ga for zabaione? It’s a classic. I just haven’t had the time to take photos and post something since then. You see, by the time I’ve finished filling the little golden puffs with whatever happens to be the gusto del giorno, random members of my family appear out of thin air and they disappear so fast, I’m pretty sure there’s a warp drive involved. I had two of them hovering like vultures as I filled these gorgeous little babies with a lush pistachio crema. I literally had to threaten them and shoo them both away so I could take a few photos. In a rush. With a promise they could taste test the finished product. Why? Because the choux rules. Everyone loves them. Italians call them bignè and the little ones like these we refer to as mignon … part of a lexicon of tiny pastries and probably the most popular in any Italian pasticceria. These particular mignon, I wanted to share with you. Because pistachio bignè are totally swoon-worthy. Yep, this is what I was planning for that delectable pistachio butter in the previous post. Use a smooth creamy dark chocolate for this. Valrhona’s Araguani or Michel Cluizel’s Vila Gracinda are both fantastic. I used the latter. Wonderful with the nuttiness of the pistachio cream inside. They just beg for the company of a good espresso … and you. 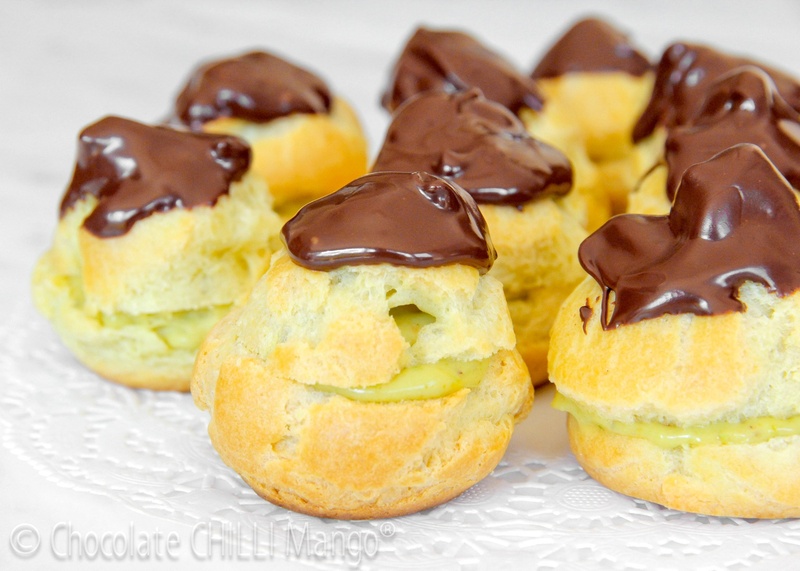 You can make small choux puffs (profiteroles) or classic oblong éclairs, or any shape you like. Check out my post on Gourmantine’s Blog for a different take on piping éclairs for a pretty effect. Note that the recipe indicates 3 to 4 eggs for the choux pastry. How much egg you need will depend upon the size of the eggs, the flour, and the weather. Flour absorbs moisture differently between brands, at altitude and in different weather conditions. I would strongly urge you to resist making these in humid weather. 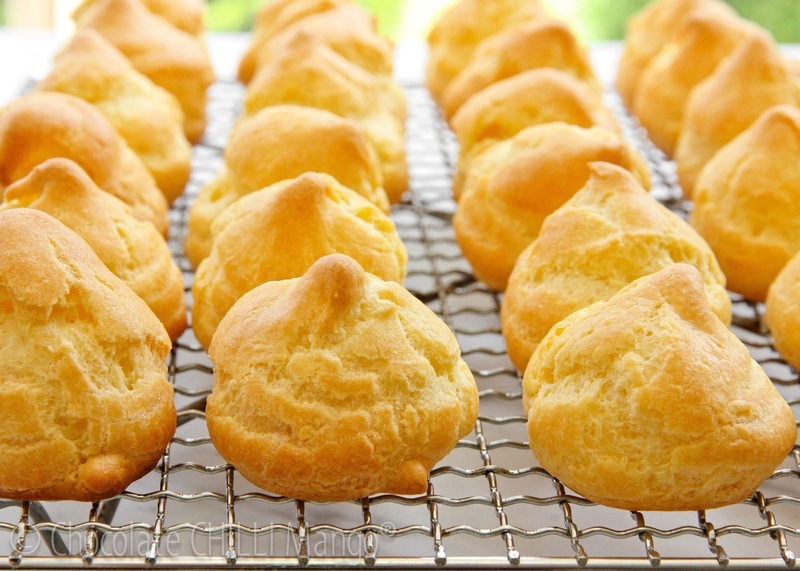 Humidity can ruin choux pastry and instead of puffed up golden shells, you could end up with little bullets of dough. Make the crema ahead of time and refrigerate for several hours or overnight before filling the shells. Place the egg yolks, sugar and cornflour in a bowl and whisk together until smooth and light. Place the cream in a heavy-based saucepan over a low heat and bring to a low simmer. As you continue to whisk the egg yolk mixture, slowly add the hot cream to the mixture. Whisk until thoroughly mixed. Return the pastry cream mixture to the saucepan, over a low heat. Do not allow the mixture to boil and continue to stir with a whisk or spatula to ensure the cream remains smooth as it thickens. Continue until the pastry cream has thickened. Pour the cream into a bowl and continue to whisk until cooled. When cooled, whisk in the pistachio butter and the bitter almond aroma, if using, until smooth. Chill until ready to fill the bignè. Preheat the oven to 225°C. Line a large or two medium baking trays with baking paper or a silpat sheet. Place the water, butter, salt, and sugar into a saucepan, over a low heat. Do not let it boil while the butter melts and sugar dissolves. When the butter has melted, raise the heat a little and bring to the boil. As soon as it boils, take off the heat and tip in all the flour at once. Beat vigorously with a spatula or flat wooden spoon until the mixture is smooth. Return to a low heat and keep beating until the dough leaves the sides of the pan, comes together in a mass. Remove from the heat and tip the dough into the bowl of a mixer. Let cool slightly. When the dough has cooled a little, start mixing at medium speed, and slowly add the beaten eggs. You may not need the whole amount. I usually add 3 eggs and then slowly add a little more, if required, a little at a time. If you add too much egg, the choux dough will be difficult to pipe and will not hold its shape. Keep mixing at medium speed or beating briskly by hand, until the dough is smooth, shiny and can hold its shape. I only needed 3 eggs this time around. Fit a large piping bag with a plain piping tip and fill with the choux dough. Pipe the dough into mounds about 4cm in diameter. Make sure to space them evenly to allow for them to puff up and expand. Alternatively, pipe éclairs of 8 to 9 centimetres in length, using a knife to cut off the ends neatly. Bake the bignè at 225°C for about 10 – 12 minutes until they are puffed and starting to colour. Reduce the oven temperature to 180°C and bake for a further 15 – 20 minutes until cooked. The shells will be golden and hollow when tapped. Switch off the oven and leave the pastry shells for a further 10 minutes, with the oven door ajar. Remove to a wire rack to cool completely. Use a serrated knife to carefully cut each bignè or éclair in half horizontally. Fill a piping bag with the chilled pistachio crema and pipe the cream into one half of each shell. Alternatively, use a spoon to fill the shells. I just like to pipe it. For the chocolate coating, melt 75 grams of the chocolate in the microwave in 20 second bursts, stirring after each, until melted. It should take around one minute all up. Stir in the remaining chocolate until melted. Finally, stir in the butter, if using. It adds an added sheen and richness to the chocolate but is not necessary. Dip the top of each shell in the chocolate and place on top of the filled base shell. Alternatively, you can just spoon a little chocolate over the top of each after you’ve already placed them on top. This is a simple topping but really delicious. If they don’t all get eaten within 10 minutes of being filled, store them in a covered container in the refrigerator. They will keep for a few days. The choux pastry may soften a little but they will still be fabulous.